Walking along Eixample streets it is not rare to find curious metal adornments like this, guarding the entrance of modernist houses. I am not sure about the real purpose of such figures but it is obvious it wasn't purely aesthetical. 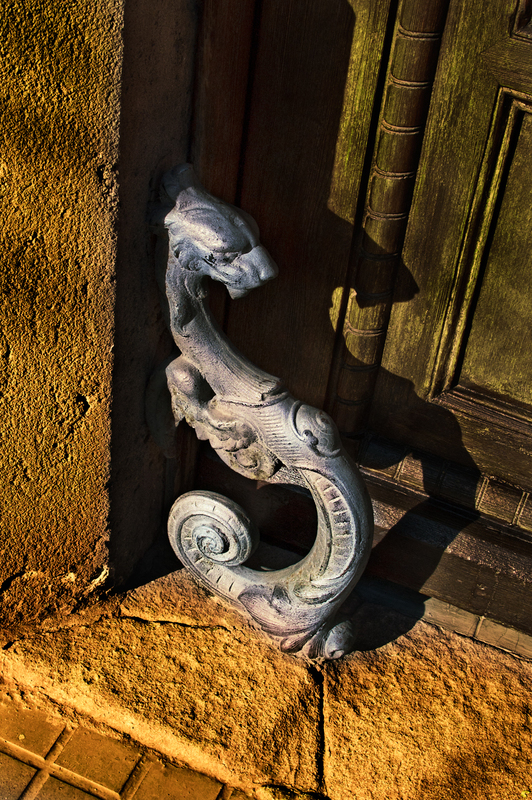 One of my theories is that between the door and this mythological creature, you could easily slide a wooden board to protect the house against flooding. This was usual practice in Barcelona not so long ago. Nevertheless I am not sure about this and maybe some of you may think of another use. Maybe you're right about the flooding, but here you see these often to scratch the mud of your shoes before entering the house. But the photo is a beautiful detail. Maybe you could lean your wet, dripping umbrella there to dry off? -Hey, scratching the mud, I didn't think of that one! Thanks! -Although dripping an umbrella is not that crazy either! I agree. I would say it was a boot scraper too. Don't know what exactly it might be, but the shadows and photograph is very nice. It's amazing how something so ordinary can be art.